Talk N Text has finally abolished prefix codes on promo call, in case your not familiar with prefix codes, these code are usually 4 numbers before the 11 TNT numbers (ex. *353509101234567) which means you can dial 09101234567 directly without memorizing any codes. This info came directly from Talk N Text and tried and tested ko na rin ma Ka-Tropa. Aside from direct calling, hindi na rin nahahati sa 5 minutes per call ang bawat call mo. Which means kahit straight 20 minutes call ay pwede unless may problema sa signal. Some promos like TOT10 also gives free 30MB of data na pwedeng gamitin pang surf or Clash of Clan. Napaka convenient nito mga Ka-Tropang Talk N Text. This comes with 30MB of data valid for 1 day. Data allocation can be used on playing COC, Youtube streaming, Instagram and more. nag register po ako ng t20 sa 4547, pero d ako makapag call, help! How do i stop my subscription on UNLI150? 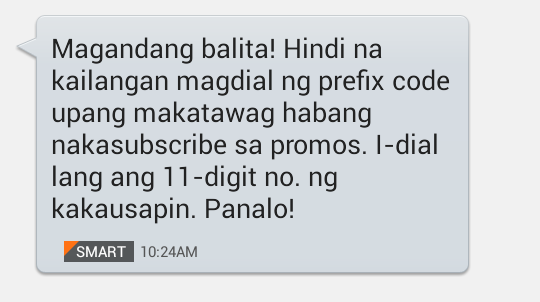 Where do i go to stop my unli150 subscription , how to unscribe on this promo?